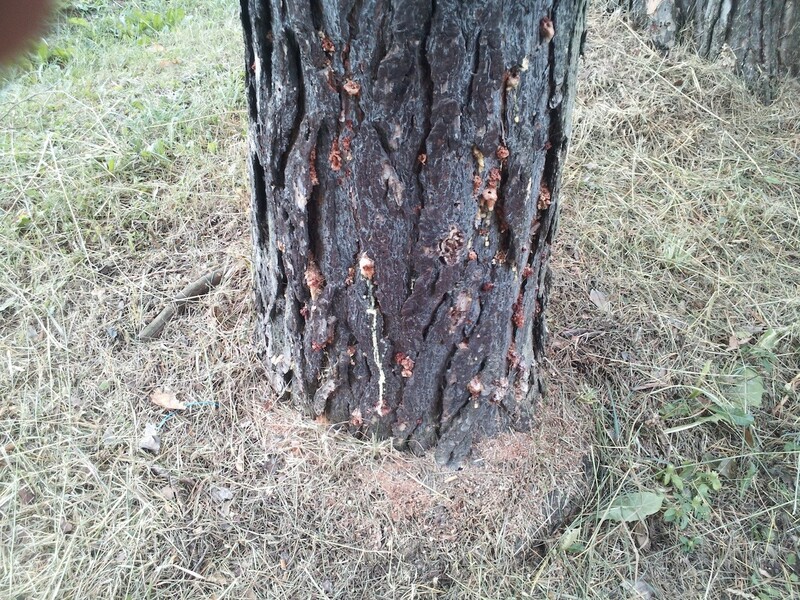 Our arborist says we have Zimmerman Pine moths larvae in our Austrian Pine – do you have any product to help deal with them? Due to the fact that specimen labels for pesticides include a finite list of target pests, it’s sometimes not easy to find a specific insect listed. Such is the case with Zimmerman Pine Moths. Fortunately there are a few products that work well at controlling local infestations because how the Zimmerman moths infest trees is similar to many other pests. And the treatments for these other pests will work equally well on the Zimmerman moths. As you may or may not know, Zimmerman moths hatch as worm like larvae which feed on any species of pine but seem to really like Austrian and Scotch. Though secretive by nature and very rarely seen, the symptom of seeing “popcorn” like pitch masses on the bark or branch whorl is a good indication Zimmermans are at work. 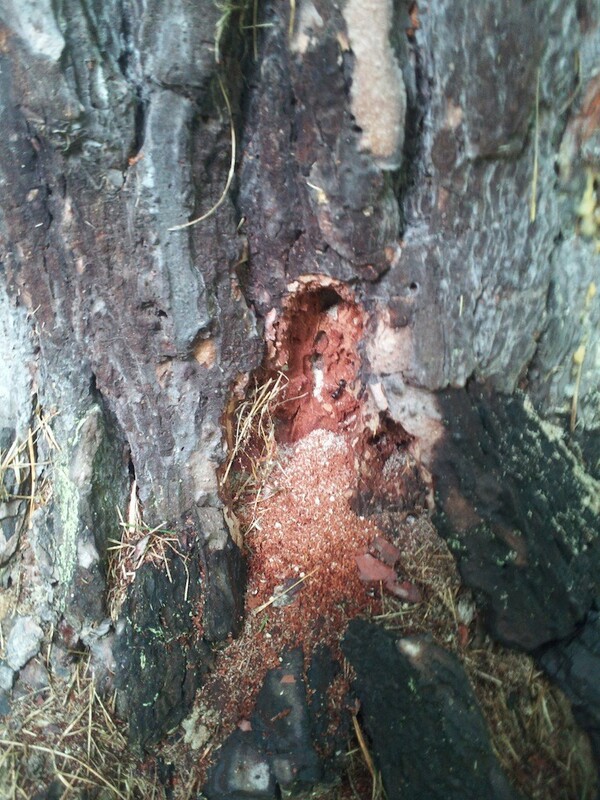 Sawdust can also be found when larvae are active. Unlike many insects which overwinter in their pupae case, Zimmerman moth larvae are more likely to hibernate as small larvae. These worm like caterpillars hatch late summer and throughout the fall. Typically this late season brood won’t feed but they’re easy to target since they’re young, vulnerable and still active on the outside of the host tree bark. Once hatched, they’ll forage on the bark of the host tree looking for nooks, cracks and gaps in which to roost. Eventually they’ll chew their way in and cover themselves in a white silk designed to protect them all winter. 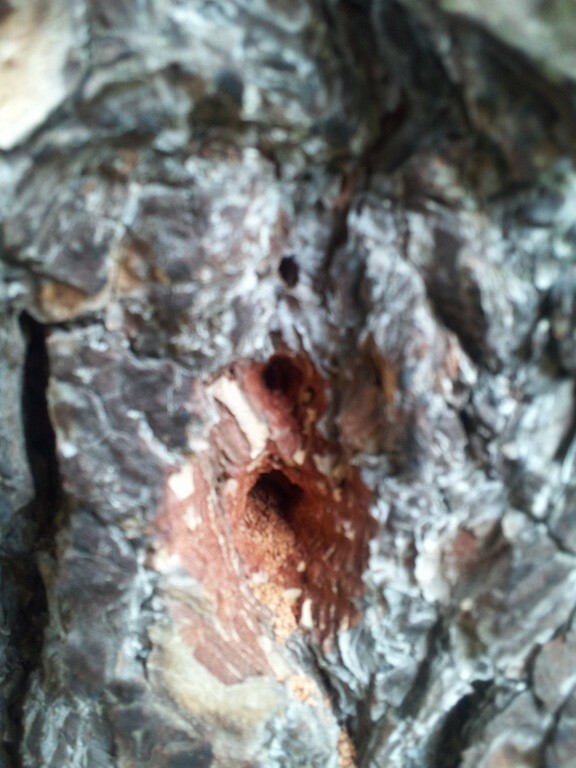 The following spring they’ll get active burrowing deep into the phloem of the host tree. For the next few months they keep active chewing away and in some cases moving out and in creating more and more entry points all of which tend to weaken the host tree. In mid summer the larvae pupates into adults which emerge, mate and lay eggs. 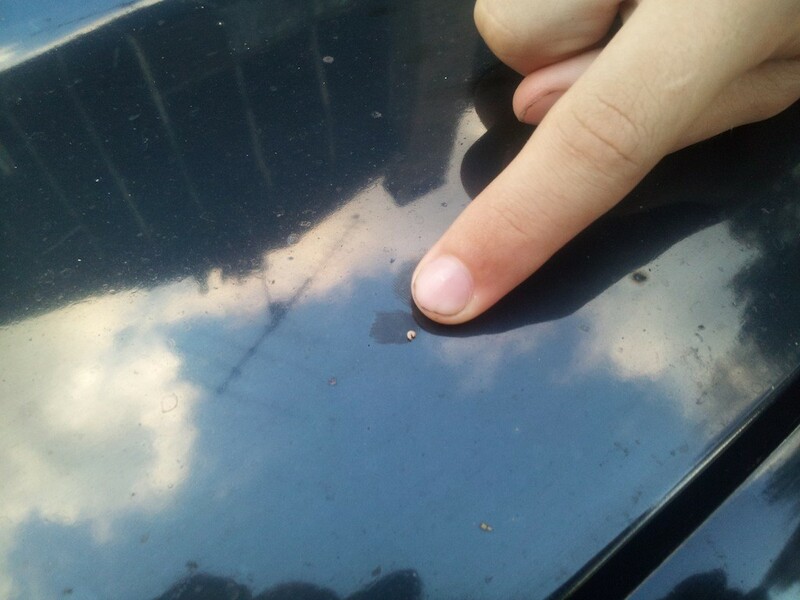 This happens quickly and at night so they’re hard to spot or see active. During the day they’ll lie motionless relying on their camouflage to keep them hidden from predators. Eggs will hatch in late summer through fall so exterior sprays can really impact the activity by breaking the cycle, covering up pheromones and ending the larvae activity before they begin boring for the winter. The best spray for this is the oil based BIFEN XTS. Its fast acting and highly repellent to any insect so treatments done to a trees exterior will both kill hatching larvae and repel other bugs too. Mix 1 oz per 5 gallons of water and saturate the bark of any tree needing protection. Be sure to spray up as high as possible and make monthly treatments from spring to fall for one year. Use a good HOSE END SPRAYER to deliver the product. In general, these can reach 20-25 feet in height depending on the water pressure at your home. 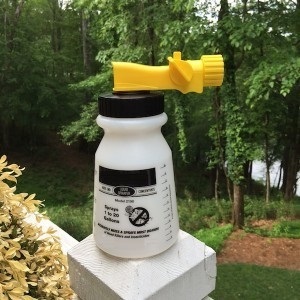 When using this sprayer, you’ll need to add 1 oz of Bifen to the sprayer and then add water filling it to the 5 gallon line. This means you’ll be pumping about 5 gallons of mixed material out when spraying and this should be enough to treat 1-2 trees. Remember to treat the infested tree along with any close by you want to protect. 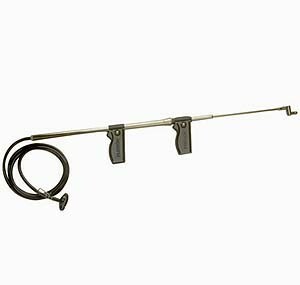 Now if you don’t have strong water pressure or if your hose isn’t long enough to reach the trees you want to spray, consider getting a TROMBONE SPRAYER. These work as their name implies; you have to slide the pump mechanism like a trombone to get the spray to come out and it can reach heights of 25-30 feet when pumped by the average adult. It features a 6 foot long hose that can be placed in your tank full of premixed Bifen so the tank and sprayer can be brought afield to the spray site. 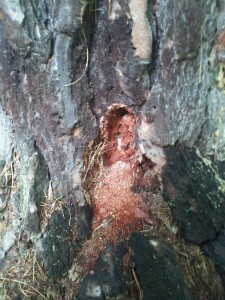 Since the larvae will drill down deep into the trees bark, you can many times impact them using a systemic known as DOMINION. 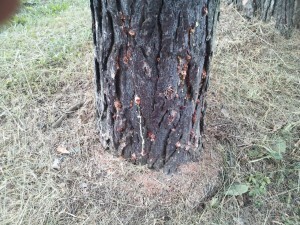 Apply this once a year to get the tree embedded with the active that will protect it against any insect. To treat, you’ll need to make access holes in the ground using a piece of rebar or a pick-axe. The average tree 12″ wide will need 10-15 holes that go at least 12″ down in the ground and they need to be inside the drip line. 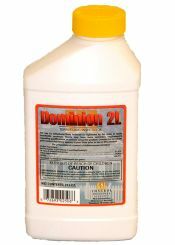 For a tree 10 inches wide, you’ll want to use at least 1-2 oz of Dominion mixed in 5 gallons of water. This treatment can be done any time of the year and should be done annually. Once it’s been eradicated, do you need to continue preventing every year? That’s your call. In fact most all insect problems can be prevented by treating every now and then. For something like ants or palmetto bugs here in the south, treating every month or so really helps. But pine moths aren’t as persistent so you may be able to go a few years with no issue. That being said, systemically treating with the Dominion will stop most any pest from taking advantage of your trees so using it once a year would help keep them healthy and happy. And since it doesn’t cost much to do, probably a good idea.